Citrus greening disease — caused by a bacteria spread by psyllid insects — is threatening to wipe out Florida's citrus crop. Researchers have identified a small protein found in a second bacteria living in the insects that helps bacteria causing citrus greening disease survive and spread. They believe the discovery could result in a spray that could potentially help save the trees from the bacterial invasion. Wolbachia is a bacteria found in nearly 60% of all insect species, including the psyllids that spread citrus greening. It is not the bacterial cause of the infection, Candidatus Liberibacter asiaticus is, but Wolbachia provides protection for that bacteria as it rides along in psyllids, ready to infect citrus trees. "In this case, one bacterium is doing a favor to the whole bacterial community living within the psyllid by shutting down a potential threat to survival of insect host," in the form of the other infecting bacteria, Dean W. Gabriel, of the University of Florida in Gainesville, said in a press release. The new research, published in the May/June issue of mSphere, was conducted by a team from the University of Florida, a state particularly hard hit by citrus greening. Huanglongbing, also called citrus greening disease, starts as vein yellowing on leaves of citrus trees. Then, a blotchy mottle appears a random pattern of yellowing on leaves. Within a year, the yellowing spreads throughout the tree and fruit yield decreases. Fruit that is produced is small, not round, and remains green at the end opposite the stem. Fruit taste is affected, as well and can taste salty and bitter. Also called yellow dragon disease, it is believed to have originated in China in the early 1900s. Citrus greening is a bacterial infection spread by two species of psyllid insects. One species, the Asian citrus psyllid, Diaphorina citri, has been present in Florida since 1998. When the psyllid feeds on the trees, it injects bacteria into the tree's phloem, a system that transports sugars produced during photosynthesis from the leaves to the rest of the plant. It's like a little cunning burglar sneaking in under the radar. It impacts the tree from its roots to its shoots, and has a long incubation period: By the time disease is detected in one tree, the entire grove is thoroughly infested and much more difficult to treat. Three alphaproteobacteria found in psyllids cause citrus greening in different parts of the world. The Asian strain, Candidatus Liberibacter asiaticus was found in Florida in early September 2005. Since the disease first hit Florida, the acreage planted with oranges has decreased 26% and the yield dropped 42 percent. The USDA predicts that the 2016–2017 orange crop production will be 14% lower than the 81.5 million boxes produced the previous season. A study by the University of Florida four years ago found the disease had caused $3.63 billion in economic damage and eliminated 6611 jobs. Presently, there is no effective treatment or cure for citrus greening disease. States like Florida that have citrus trees affected by the infection, quarantine crops — ensuring that trees and fruit cannot leave. That doesn't stop the psyllid insect from moving on, though. The University of Florida recommends several approaches to managing the infection. Trees should be inspected at least four times a year for signs of the disease and any removal of trees showing symptoms. The use of disease-free nursery trees can eliminate bacteria passed by grafting from infected trees to other trees. To ramp up efforts to find ways to combat this growing threat to the US citrus crop, in April the USDA announced they'll be giving out $22 million in research grants to help find a solution. The research conducted by Gabriel and his team was partially funded by one of these USDA grants. It represents a significant step forward in understanding how this infection develops and give us targets for intervening in the process. It is the Candidatus Liberibacter bacteria that causes citrus greening in trees. It's spread by — but does not sicken — the Diaphorina citri psyllid that it lives in. In an earlier study, Gabriel found genes in the bacteria that give it the ability to spread to plants. They also found that some protein extracts from the insects, when applied to the bacteria, could suppress those genes, preventing an infection in the insects. In the new study, Gabriel and his team identified the specific protein found in the extract that suppressed the Candidatus infection in psyllids. The protein comes from another bacteria living in the psyllids, Wolbachia, a common parasite in arthropods like insects. 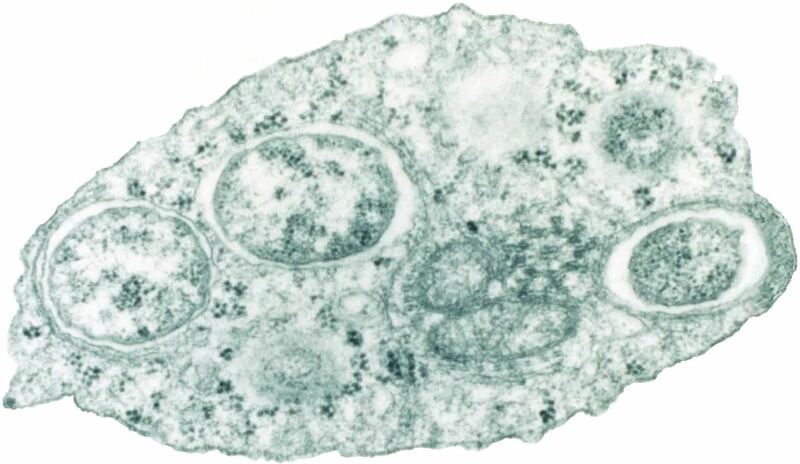 Transmission electron micrograph of Wolbachia within an insect cell. Image by Scott O'Neill/PLoS Biol 2(3): e76. The protein secreted by Wolbachia moves within the insect, into the Candidatus bacteria that causes greening, binds itself to a genetic region in that bacteria and inhibits the bacterial genes involved in creating an infection that would kill the insect. This action by Wolbachia doesn't stop the greening disease from spreading but slows the immune response from the psyllid to Candidatus. 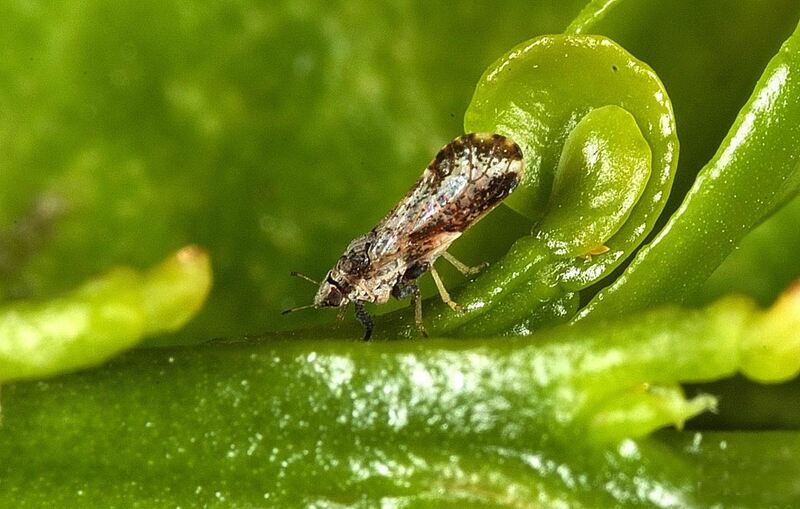 The process allows both bacteria to survive inside the psyllid, uninhibited by the insect's immune system so that it can move from the insect into citrus trees and cause disease. The new research is the first to describe this unusual type of 'talk' between bacteria living in Asian citrus psyllids, their shared host. And it explains why Candidatus bacteria can survive inside psyllids, but cause disease in citrus trees. If we can disrupt, remove, mutate, or delete this process from the Wolbachia, the insect's immune system may turn on Candidatus and destroy it, to minimize the number of infected insects, infected trees, and help Florida's citrus industry rebound. And we may be able to tweak a natural process to turn the tables and eliminate citrus greening.